It's been a busy week! I've been feeling under the weather with first a stomach bug and now a head cold... my parents were in town visiting for almost a whole week too, and we've been busy with various house fixing projects (my dad and husband) and sewing (Mom and I finished up some quilt blocks and a quilt top for the KC Modern Quilt Guild charity project.) And, yesterday was my birthday! I had a pretty good day, just wish I was feeling better is all. My parents and Lauren and I went to Lawrence and I got some fun new fabric, and some chocolate and cute little French soaps too. I will be getting a quilting extension table for my Janome for my main birthday gift, too. I will probably get a few more of the colors of the Meadowsweet henna garden (the swirly print on the bottom there). I think it's so pretty. For my birthday I also have a small giveaway--a charm pack from my vintage sheet stash. I don't have a photo but it will be about 40 squares with a few repeats. Everyone who's commented on the posts I wrote in the last 2 weeks will have one entry for each comment, and you can also enter by commenting on this post. I'd love to hear about your fall projects... or something funny... or whatever you'd like to share. I'll close comments and pick a winner on Friday. Happy belated birthday! Hope you feel better soon! That Meadowsweet Henna is beautiful! Can't wait to see what you make with it! Those are some beautiful fabrics! My sewing has slowed a bit lately...this gorgeous weather we're having! We went apple picking which led to apple pie and apple sauce and apple butter and no time left to sew! I have a few more garments to finish for my daughter's fall wardrobe before Sept 20th (basically an arbritrary deadline), then I want to make something for me...which I never do! I love your fabric. I am working on a string quilt in gorgeous Howard Marcus fall colors. It is made in a tube then cut with a triangle ruler. No peeling off paper or a thick foundation for me. Get well soon & happy birthday! Thanks for hosting a giveaway. I love the colors of the fall fabrics. certainly hope you are feeling better soon! i think henna garden might be the most perfect fabric design EVER!!! Happy birthday to you!! Happy Birthday! You got some great gifts...love the swirl fabric too. I don't have any specific fall projects, just trying to fill my etsy shop and prepare for upcoming craft shows! Happy Birthday to you! Love the Meadowsweet and how fun to have an extended table for your Janome. I hope you feel better soon;) Oh and count me in on the drawing Please! Those fabrics are pretty cute. I am working on Pat Sloan's Lucky Charms free pattern this fall. I'm having fun using some of my Chocolat fabrics from 3 Sisters. It's very fall/winter, and it's fun working with some darker/warmer fabrics now. Thanks for the nice giveaway. Happy birthday! I just finished six aprons! One for me and one for each of my five sisters! Just wanted to - no special reason. I'm giving them to everyone when I see them Monday night! Happy bday! Hope u feel better soon. I hope you feel better soon! I am working on a quilt with Civil War type fabrics for my sisters birthday. I think it is turning out pretty well. I just started quilting last Spring. I can't get enough of it. Just wished there was more time in the day! Thanks for the chance. Hope you feel better soon. Love your work. I hope you feel better soon the midwest weather is terrible right now. 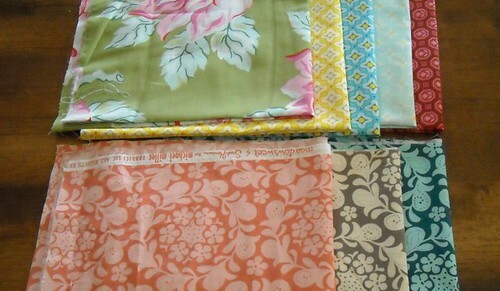 The fabrics are just gorgeous and what a wonderful gift. I'm working on a quilt for my frand-daughter and a table runner for my son. Happy Belated Birthday! My birthday is Sept 12! The big 3-0... Yikes! =) How exciting that you're getting the extension for your Janome! I have a Janome too and would love to get that for it someday. Hope you feel better soon. Happy belated birthday! It was my dad's birthday yesterday too so now I will always remember. Hope it was a great day! I enjoy getting the emails from your blog. I am loving some of the new fabrics...so different to what I have. I wanted to enter your birthday giveaway. I entered the on line quilt show a while back and have been reading your blog ever since...I usually don't comment since I very seldom have anything quilty to show. But I get a lot of inspiration..
Have a lot that has been or is going to happen with family...I am hoping after things have settled down that I can get back in the groove and get some things finished. Happy Birthday! Hope you feel better soon. Love the birthday fabric. Glad your Mom & Dad were in town to help celebrate! Love those Blue & Yellow geometrics you got - yummmm! What a sweet giveaway! If I told you about all my projects, we'd be here all day, so I'll just say, I love the Meadowsweet henna, and would probably want some in every color too! Happy Birthday! Enjoy the weekend now that you're feeling better. LOVE that henna garden.